Mandala is a perfect Punta Cana family villa, with all the bedrooms upstairs or in the guest house and the common area downstairs. You’ll love relaxing outside while the kids splash in the pool or run around the lawn, and there’s a housekeeper and butler to make sure you never have to lift a finger. Did I mention the villa’s private chef? If you want to take your family on a totally relaxing vacation, Mandala is perfect. 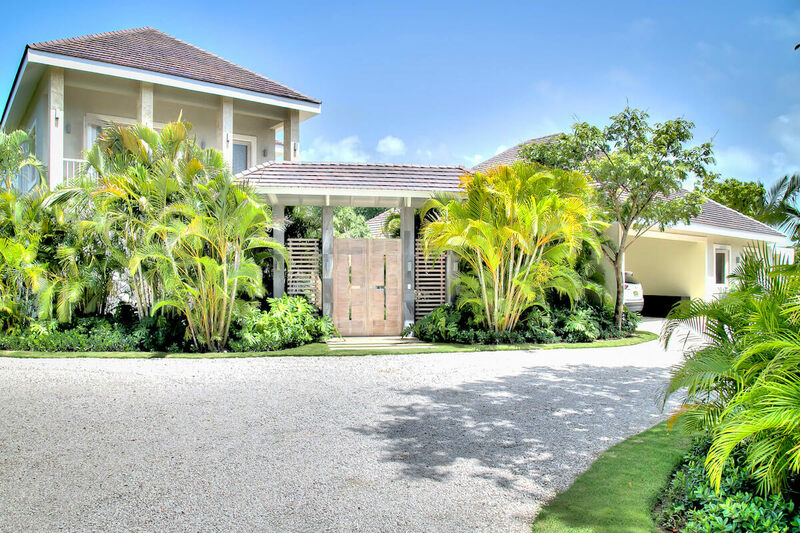 Golf front villa located in Punta Cana Resort! Mandala is a six-bedroom villa in Punta Cana, a gated resort with five-star amenities and private beachfront. Mandala enjoys golf course views, chic decor, a housekeeper, a butler, and a chef. Neutral stonework contrasts with the turquoise lap pool and the verdant, green golf course to create a crisp, modern look. The large lap pool acts as the exterior’s focal point, and the covered wraparound porch and expansive gazebo border the waters. Both spaces are perfect for lounging, dining, and enjoying the views. The gazebo also has a grilling station and prep space. The adjacent guest house has its own lounging porch and three bedrooms. Two bedrooms have a king bed and the third bedroom has two full beds. All three suites have a TV, a bathroom with a shower, and a walk-in closet. Mandala’s interior opens to the garden and pool via sliding glass doors on three sides. The common area features a lounge, books, and dining on one side and a large sectional facing a flatscreen TV on the other. The fully equipped professional kitchen also feels connected to the outdoors with a pass-through window to the gardens. Upstairs, three suites open to the wraparound balcony. The master suite has a king bed and an ensuite bathroom with a shower and tub. The second suite has a king bed and an ensuite bathroom with a shower. The third bedroom has two twin beds and an ensuite bathroom with a shower. All three suites have a walk-in closet, and the two king suites each have a TV. Punta Cana Resort & Club features golf, tennis, water sports, horseback riding, a gym, and a spa amongst 26 miles of private paradise. Restaurants are a short walk or drive away, and the beach is nearby. Nearest beach is a 5 minute car ride from villa or 8 minute golf cart ride. Upon arrival guests will be met any the airport and driven to the villa. Golf Carts rentals 4-Seater/$60 and 6-Seater/$90, bike rental starts at $20. Car rental, server, grocery and beverage shopping (pre-arrival and during your stay), liquor and wine delivery, nanny service, baby equipment, spa services, yoga and personal training, and photography can be arranged for an additional fee.